A Welkynd Stone in its pedestal. 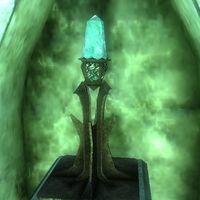 Welkynd Stones (Object ID: 00000191) are glowing cyan stones found often in Ayleid ruins, worth 50 gold. They can be used to fully recharge your Magicka, though the stone is destroyed in the process. They are required for the quests Fingers of the Mountain and Illusion Master Training. Hit them with an arrow from the side. The angle from which you fire is important, because your arrow will knock the stone away from you; if the stone is knocked behind the pedestal, it may be difficult to retrieve it. Because of this, you may want to consider saving before attempting this method. The starting spell Flare may also be used in this fashion. High Acrobatics skill allows you to jump up and reach them; a 100 point Fortify Acrobatics spell will guarantee that you can jump high enough. Fire Damage or Shock Damage spells (for example, a custom spell with 3 points damage on target in a 10 foot area) cast at the wall behind the stone will create a mini-explosion that knocks the stone down. Jump and keep tapping the activate control in the hope that you'll snag it. Note that sometimes there is a space behind the especially tall columns some stones are set upon, which may contain a hidden chest. Lithnilian at the Imperial Bridge Inn is doing research into the source of Welkynd Stones. During the quest No Stone Unturned you can help him recover his research notes and learn his theories about how the Ayleids created them. Martina Floria at the Arcane University, Illusion Master Trainer, requires 10 Welkynd Stones so she can train you. There are a total of 696 guaranteed Welkynd Stones to be found, and up to 15 more in Vahtacen. They do not respawn. This page was last modified on 20 May 2018, at 06:47.